What effect does the Wii's Virtual Console service have on the resale price of the original games? Does the price drop because people can buy the game on the Virtual Console (VC) instead? Or do more people hear about the game because of the new release which increases the demand for the original too? We found there is no statistical change in resale prices after Virtual Console games are released. The games dropped in price an average of 9.6% (see table below) but there was so much variation in the 60 different games we analyzed that statistically speaking it wasn't significant. Here is a chart showing the percentage change for each game. You can see in the chart above that there is no obvious pattern to the changes in price. Some games increased in price, others decreased in price. Below is a chart that shows the distribution of the price changes. The largest number of games decreased between 0% and -20%. 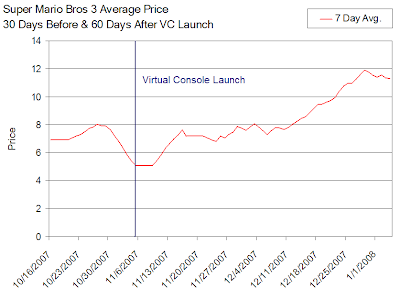 We also compared the change in price that we saw for games released on the virtual console to all games during the same time period. 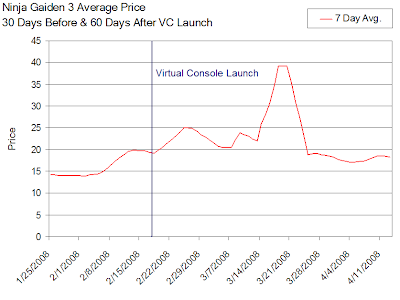 The chart below shows the average resale price change for every game (the VC release chart is shown again for easy comparison). We ran a statistical test to see if the difference between the average change for these two sets of numbers was significant. The test showed no statistically significant difference between the average price change for games with VC releases and all other games. Meaning Virtual Console releases don't change resale price. For the Virtual Console to significantly change the resale price of the original games, it needs to change the supply or demand for the original game. It needs to cause more people to buy, more to sell, fewer to buy, or fewer to sell. Here are several reasons why the Virtual Console MIGHT NOT change resale prices. I'm sure there are some Wii owners who own an NES, SNES, or Genesis (probably many readers of VGPC), but I don't think the average Wii owner does. Because of this Virtual Console games coming out won't stop these owners from buying the original game or encourage them to sell a copy they already own. Nintendo has never released solid numbers showing how many downloads the Virtual Console has for a particular title. Super Mario Bros for NES sold about 40 million copies world wide. If the game was only downloaded 50,000 times, it won't have much effect on the resale price because it is such a small number by comparison. The people who buy the old game cartridges might not want to own a "virtual" copy of a game. If they are only interested in the original cartridge for nostalgia, collecting, or some other reason; the VC release won't effect their decision at all. Below are a few charts showing the prices for the original games before and after the same game was released on the Virtual Console. The prices shown are a seven day moving average to reduce daily price swings and make the trends easier to see. Data Notes: This study includes all Virtual Console games released after October 2007 for NES, SNES, N64, and Genesis. Games released prior to October 2007 are left out because we don't have prices before that date. We also excluded a few other titles released after that date because we didn't start tracking their resale prices before they were launched on the VC. The "Start Prices" are the 7 Day average price 30 days before the game launched on Virtual Console. The "End Prices" are the 7 Day average price 60 days after launch. Wow, the Harvest Moon jump is pretty surprising. I have to admit that I stopped looking for a few games after they hit the VC and grabbed them there instead (Super Turrican 2 and M.U.S.H.A. come to mind). I consider myself a collector, but more than that I'm a gamer... so less than $10 for some of these titles is too much to resist. The reason why there is no effect on resale prices is because the limited wii space during that time. Some people, like myself, stop downloading because it was too much of a hassle to transfer games to the SD card and then delete from the console. By the time the SD card feature was enabled, many users got tired of waiting and just forgot about it and moved on to other things. Another reason could be that many Wii owners don't know that the virtual console is available. They don't know about it. If i'm not mistaken avg Wii owner only has a select few games after purchase. Most likely Wii sports and Wii Fit. how are you getting -6% overall? when i add all the numbers in the rightmost column and divide by 60 i get 442/60 = 7.37.
anyway, my intuition was that games that are rare are going to see bigger drops in price after they're released on VC, b/c the demand for actual cartridges would go down. just looking over the list it seems like this would be true, but i wrote a quick script to calculate different ranges. not sure how statistically significant these numbers are, but i thought it was interesting. geozeldadude - thanks for the correction on the 6%. It was a typo based upon old data. The correct number has been added to the article and is a 9.6% drop. It is still not statistically significant. It looks like you might be calculating the average change by adding up the % changes and dividing by the number. That method won't work because it doesn't take into account the value of the games. Blades of Steel increased 68% but went from $0.80 to $1.35, while Mega Man increased 88% but went from $17 to $32. the sample size is too small to make any definitive conclusions, but it looks like at the very least more change happens at the extremes (cheapest vs rarest), where both seem to lose value overall. Thanks for the information you provide. Its really help me a lot.